Well, if you were hoping for some plot movement this week you might have to wait. “Escapism” is less transitional than it is tangential, in the sense that the story is largely a self-contained caper in which Steven psychically visits Earth to ask Bismuth for help. Not that this is a bad thing—after a few episodes of portentous subtext and Gems talking dramatically all the time “Escapism” feels like a breath of fresh air, and a deliberate throwback to a sillier period in Steven Universe history: Storyboarded and written by Joe Johnston and former Adventure Time showrunner (and Rebecca Sugar’s old storyboarding partner) Adam Muto, “Escapism” is almost entirely dialogue-free. It’s also very funny. Despondent and languishing in the cell on Homeworld, Steven and Connie have a hard time finding a way out—the walls are too high, the windows too small, and food is running out. But one of Steven’s abilities seems likely to come in handy: his psychic powers, allowing him to potentially put out a distress call to Bismuth back in Beach City. Steven locates Earth with his psychic empathy powers, only to wake up to see the trees on Mask Island—so that we know, a moment before he does, that he has once again entered the body of one of the Watermelon Stevens. Pretty much the entire episode runs on this basic engine, having Steven go through a series of semi-predictable, but exceedingly well-done joke trials as a watermelon. Nearly everything Steven does throughout “Escapism” is funny, from the way he tries to sneak away from an incipient war between rival tribes of Watermelon Stevens (one of them has stars on their bellies, the other has lines under their eyes), shaking his head at their innate lust for violence, to shooting seeds out of his mouth to try to make his raft go forward on a windless day, to losing a foot to a hungry watermelon shark—only to hold the shark and comfort it, quenching its thirst for blood. Steven is really at the top of his game here, and Johnston and Muto wring a lot of humor out of the fact that we know him well enough as a character that his moods will scan automatically. Overripe and decaying, Steven washes up near Beach City, where Lion finds him and brings him to Greg. In another dialogue-free sequence, Steven manages to tell Greg and Bismuth that the rest of the team needs backup before passing out and leaping back to Homeworld. 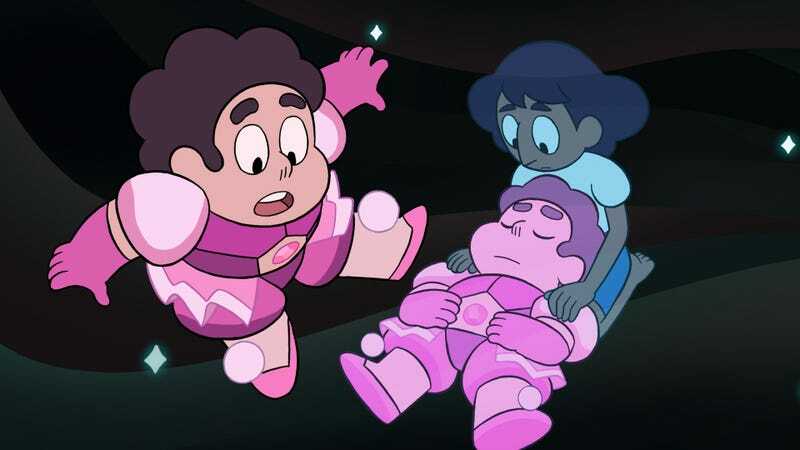 Though Steven can’t talk and we can’t hear Greg or Bismuth (who mostly communicate in gestures anyway), the scene is musically backed by “Escapism,” written by Rebecca Sugar and sung by AJ Michalka, a short and sweet song that acts as more of a button on the scene. It’s a very gentle, tender cap to this adventure, a breather and lightly contemplative moment that’s especially useful since the next episode is going to be the climactic showdown with White Diamond. The use of this piece music also calls attention to how little speaking there is through the rest of the episode. The quieter moments of “Escapism” really highlight how difficult it is to tell an entire, cohesive story with this little reliance on characters talking: Take the shot of Steven swimming in psychic mind space, seeming not to move (backgrounds are wild) as he starts to head toward Earth—a shot that gets echoed relatively quickly when he washes back onto the shore of Mask Island, still paddling like a maniac. Or my absolute favorite moment of the episode, a shot of a watermelon bird cawing, then flying off of its tree branch perch—only to immediately plummet to the ground. It’s such a simple, predictable, dumb joke (which I mean in an entirely positive way), handled with impeccable timing, to the point where I’ve laughed out loud at it all three times I’ve watched this episode. His mission accomplished, Steven wakes up back on Homeworld, in the arms of a sleeping Connie, who has promised to stay by his side. (Where else would she go?) After the day he’s had, he’s surprisingly sanguine about the rescue mission: “Guess we’ll see what happens.” You and me both, Steven. At the beginning of the episode, Steven briefly freaks out about how badly his plan has gone, which mostly consists in fretting over what Greg will think: “His only son, in jail, at 14. What a disgrace.” This is a great line, and a great Zach Callison line reading. The runner about how no one can understand Steven’s art is very funny, especially after last week’s bit about Blue Pearl’s drawings. It’s been a while since Steven Universe did a goofy joke about subjectivity and art, and I’m pleasantly surprised to see one this close to the climax!